I'm at the last leg of my Japan trip, now at Ochanomizu University to discuss some work they're pursuing here. Kyoto was a wonderfully peaceful city and I got more done there than I have done in a long time and Tokyo is also proving useful, if not peaceful. The fact that it's been non-stop now since I spent two weeks being pretty unwell in Korea means that I'm reaching my limit and my level of concentration is slipping. I'll be giving my last talk out here on Thursday and I'll be talking AdS/QCD - that will be three different (though similar) talks to three somewhat different audiences in two weeks. Comparatively not that many but I'll be pleased to have them all wrapped up. Currently the students are slowly returning to the department here having spent the last week at the Japan winter school in Hokkaido studying string field theory, with the likes of Zwiebach and Kazakov amongst others. They seem to come back filled with enthusiasm, which is great to see. Hokkaido, the Northernmost island of Japan is really a winter resort where there are both hot springs and great skiing from what I hear. They also have there own regional cuisine which consists of high quality seafoods in rich stock - great for the winter! There are too many things to finish to write anything extensive at the moment but I wanted to post a picture which I remember seeing in a book of astrophotography at school and wanted to share it. From NASA and the NSSDC and produced with ESA's Faint Object Camera (FOC) on the Hubble Space Telescope. This was certainly the first and, as far as I'm aware, the only direct observation of the surface of a star, other than the sun. For the pinpricks in the sky to suddenly become real, tangible objects was quite a revelation for me. 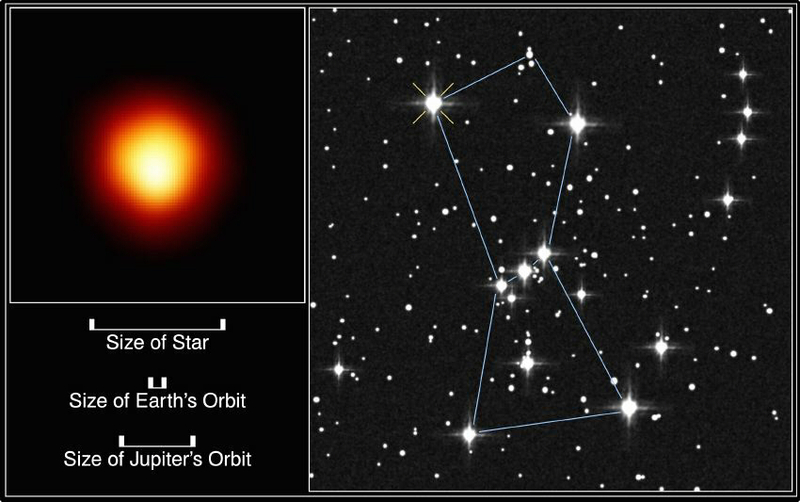 Betelgeuse is a huge star (probably around 300 million times greater volume than the sun), nearing the end of its life. The extra hot regions on the surface are more easily visible in infrared. The star will at some point in the not too distant future (astronomically speaking) explode as a supernova, sending off its outer layers to form a nebula. When it does explode it will probably be a similar magnitude to a crescent moon and will be clearly visible in the day, just as the crab nebula was 1000 years back. Anyway, just wanted to share that. Another couple of spectacular photos (and here) from the Cloud Appreciation Society. I guess there may have been some HDR play going on but they're still pretty eerie. Anyway, enough procrastinating, I have calculations which need finishing off. So much to write about, so little time!